Before we begin I must explain about some of the Finn names within this site. Earlier entries used the Finn keyboard to enter names. This keyboard allowed us to enter the the accent marks above certain letters. As an example many of the words place a mark above the o and a (most common), these marks change the way you pronounce the Finnish word. However, when we updated the WordPress program the accented characters created all sorts of problems. Some are still being corrected. So, as a result, we stopped using the Finnish Keyboard. This will, probably only be a concern to those who speak Finn. However we apologize since we wanted to make this site as useful as possible to all. My son, Eran, has added a new feature to the website. It is possible now to read the website in English and Finnish, just by clicking the appropriate flag icon. This may be the answer to the accent mark problem. We will see, Now to continue . . .
. . .Through the official archives personnel of Vaasan Province (Vaasan Maakunta-Arkisto) Finland, vital records dating back to the seventeen hundreds were retrieved for ancestors from both sides of my father, Sulo’s, family. Both Sulo’s parents were born in Finland. It was determined that the families were not acquainted with one another in Finland. Both families lived within the same general area in the Province of Vaasa, which is situated in western Finland beside the Gulf of Bothnia. The Gulf of Bothnia is the body of water that separates Finland and Sweden. The Kivisto’s, Grandmother Hakanen’s family, lived in and around Seinijoki, a city near the center of the province. The Hakanens lived in and near Jalasjarrvi; a village located about 30 miles south of Seinijoki. That general area of Vaasa is known as Southern Ostrobothinia. This is a map showing the location of South Ostrobothnia the area where both my Grandparents grew-up. Seinijoki and Jalasjarvi are located in this Provence. Dad’s Mother and Father. . .
. . Sulo’s Father, Juho (John) Jaakko Hakanen, was born July 30, 1882. He was the fifth of eleven children born to Mikko and Anna (Kurkiso) Hakanen in Jalasjarvi Finland. He had seven brothers and three sisters. Two of the boys, Elis and Eino, died in infancy, Elis in 1893 and Eino in 1894. One of Grandfather’s sisters, Lempi Susanna, died in 1896. She was two years-of-age; Grandfather was fourteen at the time. Grandfather John and the rest of his siblings (four brothers and two sisters) all emigrated to America. My grandfather’s older sister, Edla Maria, was the first to emigrate in 1895 at the age of twenty and sister Hilma was the second in 1897, she was seventeen. Edla later married John Lahti in America, we have little information about Hilma or Edla and their husbands. The only information I ever had about the two sisters came from Aunt Edith, my father’s sister. . I do remember Aunt Hilma when she came to live with the Hakanen’s. She was fighting cancer and had a hard time breathing. I remember she bought ‘medicinal cigarettes’. They had a cardboard tube tip with a chunk of something in the tube. She would puff the cigarette, hold her nose and mouth and swallow the smoke. She would then proceed to cough and chock like crazy. She wasn’t a smoker. I remember we boys sneaking a few of the cigarettes and ‘trying’ them. They were like a menthol brand cigarette with a little more ‘medicinal’ taste. I was there when Grandma found Hilma dead in bed. I was 14. Uncle Elmer held a mirror under her nose to determine if she was breathing. I was most impressed. Twenty-nine years later I remembered to do that when Mom discovered my step-dad,Bud, dead in a chair. She called me and I went to their house and used a mirror to determine that he was indeed dead. Aunt Edith related that Hilma married a man from Connecticut later in life. They lived on a farm but he was a wife beater and spent all her savings. The documents I found, regarding the two sisters, were 1920 and 1930 census reports. The 1920 report shows Helma living in New york city, district 6, ward 10. She was one of two servants living with an Oppenheimer family. The 1930 report shows the two sisters living together. They were in Manhattan Borough, district 12. Edla (Hakanen) Lahti is the head of the household. I interpret this to mean that, she was widowed, divorced or separated by 1930. The other person living there was a boarder, Alexander Rose. This is about all I can find about the sisters. One other item, several of the ship manifests show that several of the brother’s boat fare was paid by their sister. Elmer, specifies Hilma helped him, but the others, we can not be sure which sister they referred to. An early manifest (1899), which I believe is Mike Hakanen’s first trip to America, shows Mikki Hakanen’s destination as New York and indicates that his sister paid for his fare. According to the records, Isaac, the third sibling of my Grandfather to come to America, was twenty-three when he departed Finland May 5, 1900. According to information from Finland’s Institute of Migration, Isaac was a former farmhand and was unfit for military service ( the Russians were attempting to draft Finns into the Russian army at this time). He sailed from Finland on the ship Urania, destination being New York City. There were no records of the port or ship encountered in England as part of his trip. He lived only a short time in Pennsylvania before moving on to Minnesota. I did find a 1900 census document from Missabe Mountain, Saint Louis, Minnesota. It shows Isaac as one of ten boarders living with a Johnson family. According to that record Isaac was 20 and the document indicates his year of immigration was 1895. I have not been able to resolve the differences between the two records. Aunt Edith said uncle Arvid joined Issac in Minnesota and worked for a time as a lumberjack. Isaac died December 26,1908. We have not been able to find much about Isaac. Uncle Ernie also related the story of Arvid going to Minnesota. He might have gone with or visited his brother Isaac. Ernie said, he worked on a crew fighting a forest fire. He got stranded from the others and was trapped in the flames. He laid face-down in a potato field all night long and was able to escape to safety the next day. We don’t know how long he was in Minnesota but he owned a revolver and we heard Minnesota was somewhat the frontier when he was there. We kids would occasionally sneak into his bedroom at my Grandfather’s house and check-out the revolver. It was just like the ones real cowboys owned. Grandpa John’s Ship from Finland to England . . .
One of the most long-lived passenger steamers at the Hang’-Copenhagen-Hull route was this ship, the ARCTURUS, typical of all ships used to bring Finnish emigrants on the first leg of their trip to America. She was in service for 57 years. She arrived from Antwerp on her last voyage on 22nd October 1956.
. . .Available records show that Grandpa departed Hanko September 13, 1902 on the ship Arcturus, pictured above. The Arcturus belonged to the Cunard Line. The name of the ship, port, and departure date from England was left blank in the document. his destination was listed as Clearfield, PA, USA. Additional Information regarding his passport, acquired in 1900, indicates he may have made an earlier trip to America and then returned. The 1902 trip, then, would have been his second trip. His passport application stated his religion as Lutheran and his occupation as a Cottager’s Son’, which means his father leased or owned their house in town which his father acquired not long before my grandfather was born. Thus his name, ‘Hakanen’, was adopted. Hakanen means ‘little house with a pasture’. It’s surmised Clearfield Pennsylvania was my grandfather’s destination because he was joining his brother Isaac there (or possibly brother Mike, too?). Records indicate Clearfield County was one of the places where Mike lived. his daughter Helen and son Arvo were born in Ansonville, Clearfield County. Helen was born March 28, 1904 and Arvo, July 16, 1905. Brother Mike . . .
. . . It is not certain when Grandpa John’s older brother Mike came to America. He might have arrived shortly after Isaac or close to the time his brother John came. He possibly came with John. Either way, that might have been his second trip. I found a ship manifest for the S.S. New York dated July 1899. It shows Mikki Hakanen arriving in New York and New York as his destination. It also states that his fare was paid by his sister. It is believed Mike worked and sent money to bring his wife-to-be, Laimi Maria Lahteenmaki, to America. They were married in America July 7, 1903. Mike and Laimi returned to Finland with their three children in 1908 and came back to America shortly after. Records show Mike departed from Hanko November 25, 1908 on the ship Titania. He then sailed from England on the Lusitania, departing December fifth. He probably arrived in America around the thirteenth of December. Records also show Laimi and her three children, Eeli (Helen), Arvo and Urho (Roy), also sailed from Finland on the Titania from Finland February 3, 1909. They departed from Southampton England February 10 on the ship Teutonic. They arrived in America February seventeenth. Laimi was six months pregnant with her fourth child, Esther Marie (cousin ‘Billy’s mom). Mike and John Hakanen were the only siblings to have children (that is an assumption when it comes to Edla) and the annual Hakanen reunion, held at the Nanty-Glo community park, consists of Mike and John’s descendants. Billy McMullen, Mike’s grandson and I share memories of our grandfathers and others in their families. The 2012 Reunion . . . The 2012 Reunion was a very special one. We had nine, newly discovered, cousins from Finland attend the event! Five were cousins through Mike’s wife Laimi and four were related through grandma Hakanen. Her maiden name was Kivisto and we discovered many cousins through her older brother Juho and her younger sister Lempi. there is a picture and explanation about how this came about in the ,”New Cousins Discovered” album. To read Wes and others recollections and other personal thoughts click here. The other Hakanen Siblings. . .
. . Elmer, age seventeen, was the seventh of the family to emigrate, ten years after Hilma had emigrated. The records show that Elmer departed from Hanko July 17, 1907 on the ship Polaris. He apparently sailed to Leith England and then went by rail to Glasgow Scotland. He then sailed from Glasgow on the ship Caledonia July 27, arriving in New York August 4, 1907. Information from the ship’s passenger list indicates Elmer’s Sister, Hilma, purchased his ticket. The price of the ticket was 39 United States dollars. Elmer stayed in New York several years, evidently in close touch with his sisters Edla and Hilma. Aunt Edith told us that Elmer worked in New York for seven years before coming to Nanty-Glo sometime after she was born, April 10, 1915. I have a picture postcard Elmer sent to his brother Sam, who was then in Warren Ohio. The postcard which is in the Photo section of this site, was sent from Nanty-Glo and was dated August 4, 1916. Although we have not been able to translate the message on the postcard, the name Solomon Lahti seems to appear in the message and the picture on the postcard is of Elmer and another unidentified man. We believe the man is Solomon Lahti, perhaps a brother to John Lahti, the man Edla married. The conjecture is that the picture postcard was taken when Elmer came to Nanty-Glo. On a trip to Nanty-Glo from New York,, he was accompanied by Solomon Lahti. They both may have been looking for work opportunities. There is no further information about Solomon, but Elmer spent the rest of his life living in Grandfather Hakanen’s home in Nanty-Glo. Sulos brother Ernie said that all Grandpa’s brothers and sisters, at one time, lived in his household. Brother Sam was the last of the Hakanen children to come to America. He came in 1911, at the age of twenty-three. Like Elmer, his destination was to sister Hilma’s in New York City, he paid his own fare, however. He left Hanko on January 18, on the ship Titania. He then sailed from Southampton on the ship St. Paul, January 25 and arrived in America on February 3. The 1916 postcard to Sam mentioned above was addressed to him at 507 Union Street, Warren Ohio. He was probably working in Warren at that time. I was only seven when Sam died in 1939, so I have only vague recollections of Sam. He was living with John and Mary Hakanen at that time. He was ailing with a respiratory illness. Sulos sister Edith said in order to qualify for health benefits he had to live someplace other than her parents’ house. So they built a small room attached to the garage for him to stay. I remember the room. Edith said that Grandfather felt terrible about Sam staying in the shanty-like room but it was necessary for him to get proper health care benefits. An Ancestors Report which shows the ancestry of John Hakanen was developed. The information would be the same for his siblings. Many Kivisto’s came too. . .
Mary was seventeen; her sister-in-law was in her early thirties when they made the journey. 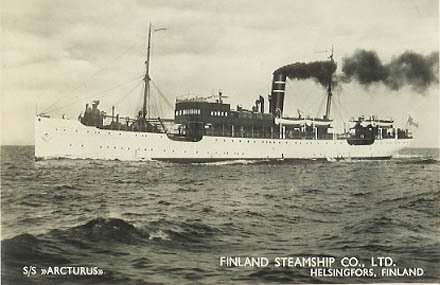 They sailed from Finland on the ship Astraea in August, 1906. They then departed Liverpool, England on the ship Lucania on August 25. They arrived in New York about a week later. They joined Jakob in Vintondale, PA, where grandma found work as a maid in a hotel. She met her future husband, John, in Vintondale. Grandma’s brother Karl came to America in 1910. He left Finland June 22, on the ship Titania and departed England from Port Southampton June 29. Four sisters and one brother remained in Finland. An older sister, Sanna Liisa, was twenty-eight when Mary left Finland. A brother, Juho was twenty-five. Three younger sisters Edla Matilda, 15; Lempi Amalia, 12; and Eliina Johanna, 7; also stayed in Finland. Information about grandma Mary’s ancestors can be seen by pressing here. 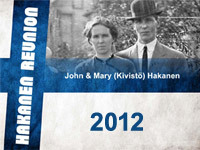 We have recently (2011) made contact with family members of my grandmother’s brother Juho and her sister Lempi Amalia. At one time I wondered if the families (Kivisto and Hakanen) were acquainted in some way prior to leaving Finland or if my grandparents met via the mail prior to my grandmother coming to America. my reasoning was that they married only five months after she arrived in America. I have since made contact with relatives in Finland and find that they did not meet prior to coming to America. I believe all the immigrants were anxious to start a new life in America and made commitments and decisions much more quickly than we do today. Sulo’s parents were married January 23, 1907. Grandfather had been in this country about four years. However, I have recently found that he came to America two years (1900) prior to returning permanently in 1902. Other than his passport information, I have not been able to find other information. The investigation goes on. For some of my personal thoughts regarding my grandparents and others, you can presshere. . . Grandmother Hakanen’s brother Jakob’s destination when he first came to America in 1903 was Ansonville. He was joining his brother Matti. This information causes us to wonder whether the Hakanen and Kivisto men were acquainted in Finland or if they met in Clearfield. It is not certain whether jobs in lumber or mining brought them there. Both were booming industries in that area around the turn of the century. It was mining that brought them later to Vintondale and Nanty-Glo. The town of, Gazzam, Clearfield County was Arvids destination when he left Finland December 3, 1902. Gazzam is a Clearfield County town near Ansonville. He sailed to England on the ship Polaris and from England on the ship Iternland, on December 10. The English port was not indicated in the Institute of Migration records. As indicated elsewhere on this site, Gazzam is where Mike and Laimi (Lateenmaki) Hakanen were married. From a self-published book on the history of Vintondale, I was able to determine that my grandfather and grandmother, with baby Veicho, left Vintondale around 1908 and Jacob Kivisto and his family left in 1909. I believe they both moved to the locations I remember as the homesteads of both. My grandparents in Finntown, Nanty-Glo and the Kivistos on the farm in Jackson Twp. The earliest ethnic minority to arrive in Vintondale in any appreciable numbers were the emigres of the Grand Duchy of Finland, part of Russia’s tsarist Empire. Some of the Finns who emigrated were from the west coast of Finland where they spoke Swedish. In all, about 250,000 Finns migrated to the United States between 1860 and 1930. About 2,500 Finns settled in Pennsylvania. An estimate of those living in Vintondale is unknown, but the majority lived on Sixth Street, which until 1917 only had houses on the east side of the street. Lutheranism was the state church of Finland, and the Vintondale Finns had a meeting house behind the Village Inn. It is not known if this building served a a bona-fied Lutheran church. According to the clerk’s 1907 minute book, the Baptist Church gave the Finns permission to use their church for services. Since drinking was a major problem among miners, many Finns joined temperance societies. Their societies and meeting halls were center of Finnish culture. Dances, concerts and plays were held there. Vintondale had its own chapter of the temperance society, Urhojen Lutlo (League of the Brave). Many Finns became involved in the Socialist movement which was growing at the turn of the century. The socialists stressed government ownership of the major industries. Many supported socialism as a means of bettering the conditions in the mines. Pennsylvania eventually had ten chapters of the Finnish Socialist Federation. Nearby Nanty-Glo was a hotbed of socialist activity well into the late 1920’s. Based on evidence from the birth certificates for 1906 to 1921, the majority of the Finns appear to have moved from Vintondale in 1909. There were only two birth certificates registered in Vintondale after 1909 that list the parents’ birthplace as Finland. The most probable reason for the departure was labor problems. Many Finns were pro-union, and there was a long strike in 1909. Families in company houses were evicted. Many of these ex-Vintondale employees settled in the unionized mines of Nanty-Glo. A section of western Nanty-Glo is called Finntown, and a Finlanders’ cemetery is still maintained there today. This is the part of Nanty-Glo I grew up in. Near my grandparents and the other Finns who migrated to Nanty-Glo around this time. Jackson twp. is adjacent to Finntown and many Finns lived there in homes and on farms. I found another book that said the Finns were “cool” to the unions. But the way I remember it wasn’t the idea of pro, or con-union, The Finns were interested in fairness! . . John and Mary subsequently had seven children: The oldest was Veikko (Waco) born January 11, 1908 in Vintondale PA; my father, Sulo was the second son born November 17, 1909. He was born in Nanty-Glo just down the street from the house where the Hakanens finally settled and where they lived the rest of their lives. Their third son, Arvid died at the age of 9 months in 1912, the exact date is uncertain. John and Mary’s first daughter, Edith was born April 10, 1915 in Nanty-Glo. Their next child was a premature stillborn male child we think they named William, there is no record of the exact date of his birth. Williams birth may not have been registered. Some say that grandfather Hakanen carried him to the Finn cemetery and buried him in the same grave as their infant son Arvid. The cemetery is just a short distance from the Hakanen’s house. Ernest, their youngest son, was born September 26, 1920 in Nanty-Glo; and Helen, their youngest child, was born February 23, 1925 in Nanty-Glo. The trip from Finland. . .
Emigrant Hotel at Hanko. Emigrant hotels were distributed at key points on popular routes and at the ports on the immigration routes, in Finland and other Countries. The most popular route was from Hanko to Hull England, with a stop over in Copenhagen, Denmark. From Hull they went by rail to Liverpool, from there they sailed to any number of ports in America. Although the ship line tickets included land transportation to a large city nearest to the destination, ships and ports were sometimes changed, depending on space and number of travelers. For the trip from Hanko to England they often crowded 700 passengers on ships with cabin space for less than 200. Alternate routes from Copenhagen were: to one of three ports in Germany and then to New York; or to Leith England, then by rail to Glasgow Scotland and on to a port in America. The closer the port was to the final destination, the greater was the profit to the ship line. The journey from Hanko to New York would, under good circumstances, take about three weeks. The travelers usually arrived in Hanko the day before their scheduled departure to take care of necessary paper work. As part of the process they had to deposit $50 in the bank as landing credit’. The landing credit amount would be returned to them once they reached their destination. This was to assure they had sufficient money to take care of themselves if they could not find immediate employment. We have not yet been able to trace all the family members routes to America but keep working at it from time to time. As explained in the photo album section, two cousins born in Finland. and now living in England and Finland contacted us recently and made a connection with our past in Finland. Their names are Arja and Pirkko and their grandmother was a sister of Laimi, Mikes wife. Pirkko now lives in England and visits Finland annually. She and her husband are considering buying a summer home there. Cousin, Arja lives in Turko, Finland. She and her husband have a summer cottage in Jalasjarvi, near the old homestead. She lived as a young girl in Germany. Because of the circumstances before and during WWII, her parents sent her to Jalasjarvi and she was raised by her Grandparents. Pirkko and Arja have provide a ‘window’ into the Finnish world that has been invaluable. Their pictures are in a sub-album of the Hakanen album in the Photo section of this site. Until this contact all we had about the family was a letter to cousin Janet’s Mother from a ‘Sulo’ in Finland. We had no idea who Sulo was (my Dad’s name was Sulo). The contact has clarified that. Pirkko explained it this way: ” Sulo Niemisto’s who wrote to Mike and Laimi’s youngest daughter, Anne. Was Hedvig Sofia’s son. Hedvig Sofia was Laimi’s younger sister (by 15 years), and there was another even younger sister Lilja Susanna who was born in 1899. Totally there were 9 children. Aini-Liisa was the eldest and Laimi was the second eldest. Uncle John (Aimo Juho) and Uncle William (Viljo Mikael) were Laimi’s brothers. Pirrko’s dad Aarne never met his cousins, as he was born in 1918. Questions regarding Grandpa Hakanen. . .
Information in this document seems to imply that Grandpa Hakanen came to America in 1900 and returned shortly after. Our cousins are helping us answer some of these questions through their access to documents in Finland and their knowledge of Finnish history. At the 2010 reunion, we shared what we knew about the various immigrant ventures. No one seemed aware of the possible repeat trips of Grandpa John and Uncle Mike.